Some customers have sent feedback about the different packages and USB ports for the same model product. Indeed some products have more than one kind of packaging and different USB colors, which occasionally make customers question the authenticity of their product. We apologize for that inconvenience and would like to publicly express the differences to avoid future confusion. Here, we will now give a brief explanation of our packaging and USB color options. 1.Why does Tronsmart have more than one kind of package for the same model? We design our packaging with different functions in mind, based on the specific model. For same models we have one package that is designated for online store selling and another package for local store selling. The pictures below show one example of the online selling package and the local store selling package of our Tronsmart WC1T wall charger. This simply helps us to track internally as well as keeping vendor inventory segregated in our global warehouses. We have two kinds of commonly seen packages for our products sold online. One is a purple colored package and the other is a white colored package. Take the Quick Charge 2.0 wall charger (model number: WC1Q ) for example, our previous packaging is purple colored. To reduce the cost and make the product more affordable, we changed the purple colored package to a plain white colored package. The main reason for this change is to reduce overall cost on these items that also incur shipping expenses for Tronsmart and offset the difference in price vs. retail inventory. For most of our Bluetooth audio products, we use white or black as the main color of our packing boxes. But there are few of our previous package box are purple-colored. They are Tronsmart Element T2 Bluetooth Speaker and Encore M1 Bluetooth 2-in-1 Audio Transmitter and Receiver. You can compare the old package box with the latest new ones as the following images. Now, most of the two products' package is the new white ones, but there are some previous purple-colored package boxes spreading on the market. You may find that the USB ports on your Tronsmart charger have a different color pattern compared to current models. 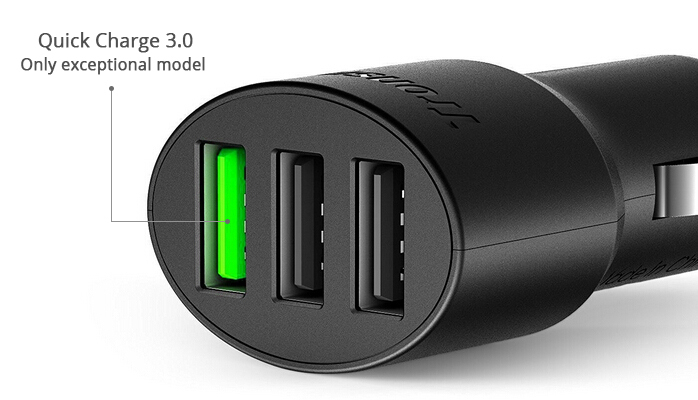 Until now, we have featured three different colors on our USB Ports — Black, Blue, and Green. Each color represents one certain charging technology that we make available for our customers. Here is a quick breakdown of those colors and their meaning. Black Colored USB: This color features our intelligent-charging VoltIQ technology. Learn more about VoltIQ by clicking here. Blue Colored USB: Qualcomm Quick Charge 2.0 and Quick Charge 3.0 technology. Learn more about Quick Charge 3.0 by clicking here. Green Colored USB: Integrating both VoltIQ and Qualcomm Quick Charge 2.0/3.0 in one USB port. As the technology has developed over time, we have updated the charging technology offered on various products, and the color of the USB port has also changed accordingly. For example, our Tronsmart Presto power bank has two versions, the previous version is with blue color USB port, and it means that the USB port supports Quick Charge 3.0 technology. The latest version is with a green color USB port because we have updated the charging technology and now the green USB port can support both Quick Charge 3.0 and VoltIQ technology. This change is one of the many advancements in design and performance that we offer for current models. Note: All of chargers models obey above regulations. But there is only one exceptional model. In C3PTA car charge, the green port is only referred to Quick Charge 3.0 technology, this is the only one exceptional model. We have three kinds of surface finish for the logo and text markings on our chargers. They are laser, silk, and carving finishes and each offers a different product designation. Each of these three kinds of production markings located on Tronsmart chargers are genuine products directly from Tronsmart factories and are 100% authentic. As technology develops, we will continue to update our products, some of the product packaging, and some of the USB colors will potentially be changed. We will inform the community regarding any relevant changes on this page and if you still have any question about our products, feel free to write to support@tronsmart.com.